He is the former professor of Film and Screenwriting at Boston University, and had been acccepted at Montana University. A documentary on his story – “Stumped” – was screened on June 2, 2017 at Inside Out, Toronto’s LGBT Film Festival. When Will Lautzenheiser looks down at his hands, he sees scars he doesn’t recognize. 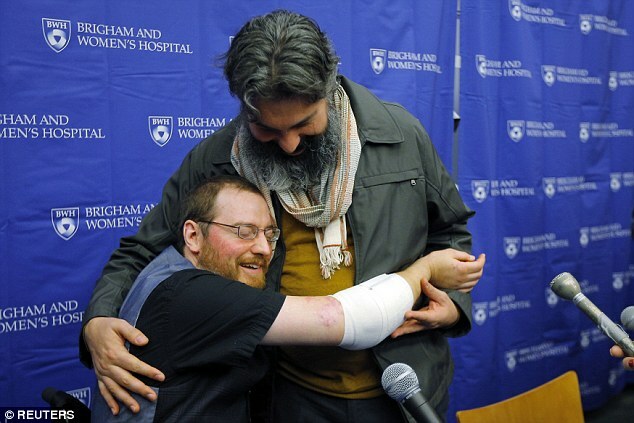 Last year, the 41-year-old Bostonian became one of just a few Americans to ever receive a double arm transplant after losing all four of his limbs to an aggressive streptococcal infection. 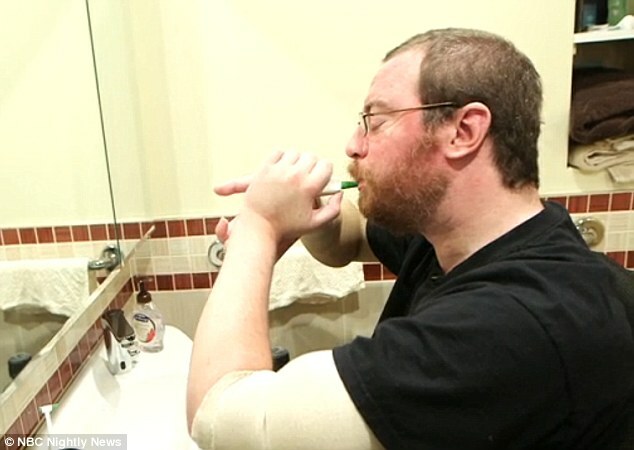 Now, in a film for NBC Nightly News, Lautzenheiser has shown how he is relearning to feed himself, brush his teeth and even walk again – and how he sees the donor’s arms, scars and all, as his own. 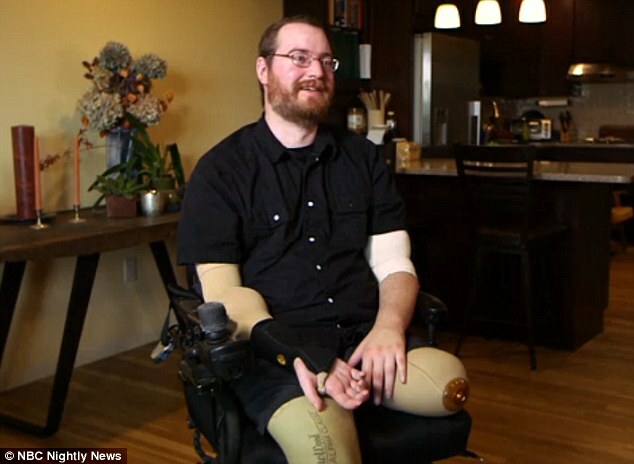 ‘You generally don’t imagine something as catastrophic as losing all four of your limbs,’ he says in the film. ‘But then something even more incredible which is the potential of getting limbs back. Lautzenheiser, a former professor of film production and screenwriting at Boston University, was about to start teaching at Montana State University in 2011 when he felt a twinge in his right leg and went to the doctor. After collapsing at his doctor’s office, he was raced to hospital and initially diagnosed with an appendicitis – but his condition deteriorated rapidly and he was put on life support. As his kidneys, liver, spleen and even his heart began shutting down, a sample taken from one of his legs revealed that he had suffered Toxic Shock from an invasive streptococcal infection. But he was also struck down with necrotizing fasciitis, a serious bacterial skin infection that began eating away at his tissues in his arms and legs. 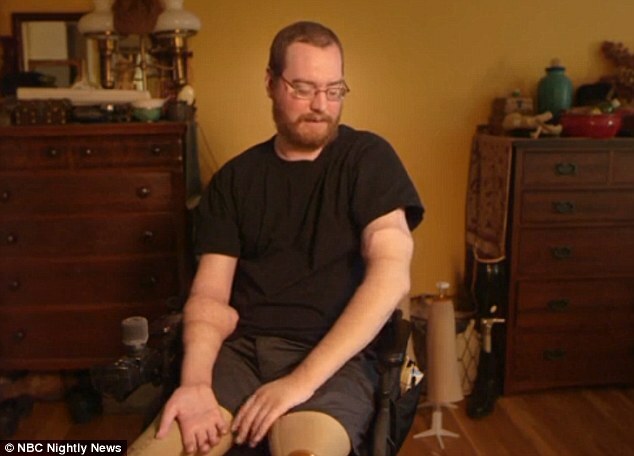 When he saw one of his arms ravaged by the infection ‘it was like looking at a mummy’s arm’, he said, and he agreed with doctors when they said they needed to remove it. To save his life, surgeons were forced to amputate his left arm above the elbow, the right arm below the elbow, and both legs below the knee. So he did. It took ‘months and months’, but with the help of his partner, Angel Gonzalez, he relearned how to look after himself, clean himself and write again. He also turned to stand-up comedy – or ‘sit-down comedy’, as he calls it – to comment on how absurd his situation was and so that he wasn’t pitied. 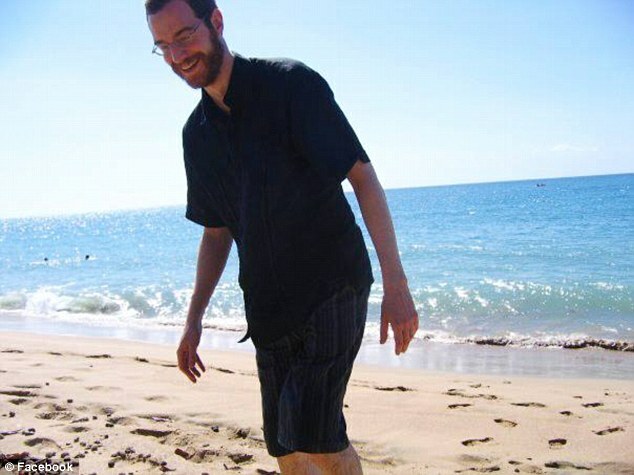 After hearing about arm transplants while in hospital, he underwent a year of tests to determine whether he would be a good candidate for the surgery, and learned that he would be. He knew he would need a great deal of medication and would have to scrap all his hard work to re-learn how to complete daily tasks again – but he was willing to try for the sake of having arms. Then in October 2014, he got the call that there was a suitable donor. The donor’s family has never revealed the person’s identity. Lautzenheiser underwent nearly nine hours of surgery, during which time 13 surgeons connected the arm bones and then the tissues. As the team at Brigham and Women’s hospital announced the successful operation, a statement from the donor’s family was read out. Lautzenheiser said the sentiment moved him to tears. Since leaving the hospital, the nerves in his arms have continued to grow and will continue to grow for many years. Doctors say they expect his strength and mobility to improve as he continues therapy three times a week. But he is now able to brush his teeth on his own, pick up food and feed himself. He is also able to type on a keyboard and his boyfriend can strap a fork to his hand when they go out for dinner. He is also enjoying the simple things again – such as hugging his niece, touching his twin brother or feeling gentle sensations on his skin. While he mostly still uses a wheelchair, he has also been fitted with prosthetic legs and is able to lift himself out of the chair and walk. 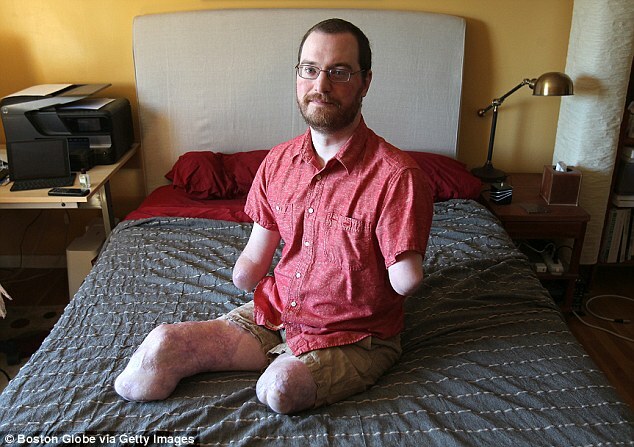 Having his limbs back has changed everything, he said. Next story Seinfeld – would it have been even better if it were told by the women?